South Africa in 1985, the country is a political boiling pot when a British mining company with invested interested in the lucratice gold mines of SAF make a call to action and possibly save their mining profits, they notify their head of public affairs Michael Young (Johnny Lee Miller) to come to a agreement between the Afrikaners, headed by philosophy professor Willie Esterhuyse (William Hurt) and the African National Congress leader Thabo Mbeki (Chiwetel Ejiofor), to free the currently jailed Nelson Mandela and ultimately ending the dispute tearing the country apart, though despite all the work from all parties involved, the antagoniser and head of National Intelligence Service, Dr.Neil Barnard (Mark Strong), is going to do anything it takes to make sure the talks fail. Endgame is one of those rare movies that slips well under the radar, it did pick up a few nominations here or there, but never anything solid. 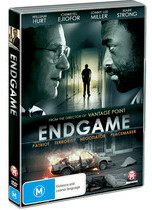 The movie shows a gritty and real portrayal of a South Africa torn apart with an unstable government and two discernable sides. The footage used is real and brings forward a slamming impact and sense of overwhelming emotion, as the scenes then transform into the filmed script, you are so compelled by the imagery and heart breaking storyline you can’t help but feel slightly moved and only get immersed by the scenes even more. The four key actors of Hurt, Ejifor, Miller, & Strong each put together a brilliant performance in what would be easily considered a hard performance to bring out. The dialogue has bleeding emotion and a raw energy that is extremely hard to find most of the time. The confronting subtexts of the film with issues such as racism, corruption, and exploitation make you question even your own values and belief structures as well as bring to lie the plight of thousands of people still living in these conditions. The core of the film however is that it is a thriller, with the extreme conditions all around there is a strong sense of uncertainty as you follow Young through the South African warzones and try and establish who is fighting for what cause. Even though the majority of the film features table top discussions between the two opposing leaders, there is a intense amount of gripping tension held in the movie that is a heart stopper at moments and almost overwhelming at times. The feature is shot perfectly and the integration of archived footage and fresh scenes are seamless, as well as this the young and sometimes innocent nature of modern South Africa plays as a interesting backdrop to a intense storyline. While other, more bankable films such as District 9 and Invictus had already taken the award contentions in regards to film portrayals of South Africa, this film is a glaring omission that is well deserved of a fresh look.